The Murders, Madams and Mediums tour caps at 25 people so please arrive early to secure a spot. If you would like to reserve a spot on the tour, give us a call at 406-220-2678, send us an email at info@extremehistoryproject.org, or buy a ticket online here. From horrific murders to notorious madams and mediums communicating with the spirit world, Bozeman’s darker history comes to light in a walking tour designed to send a shiver up your spine. Hear how “Steamboat Bill” murdered the China woman Linn Lum and Bozeman’s “Week of Horror!” Learn how Mrs. Mounts proved to Bozeman society that she could communicate with the dead. 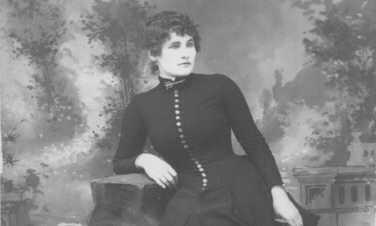 Meet Louise Couselle, Bozeman’s notorious madam whose income rivaled that of Bozeman’s wealthiest merchants. Join us to explore Bozeman’s dark side on our Murders, Madams and Mediums tour. A big thanks to The Western Cafe for sponsoring this tour! We are doing a test run of using phones and tablets to display the pictures of the tour. In order to do this we will ask people to download a QR reader from your App Store – iTunes, Google Play, etc., and then we will have a QR code to scan which will better allow you to view the pictures during the tour.